Austrian bread dumplings are an absolute treat and Zedl, our traditional family bread, is the BEST starting point for making these brilliant boiled bread balls. 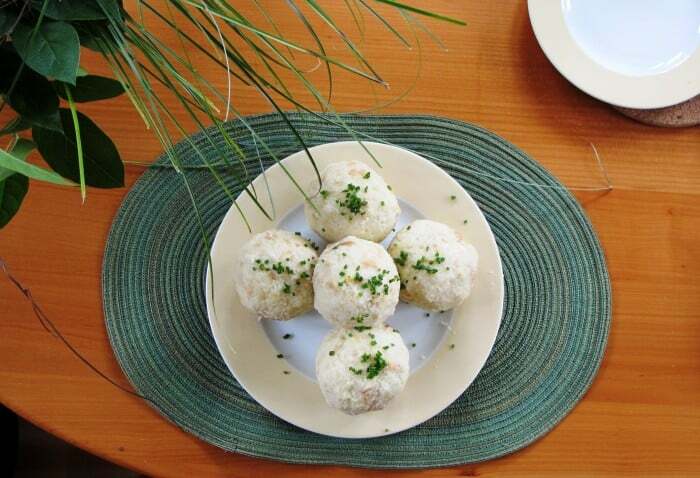 In general, you will only need a few ingredients to make Austrian bread dumplings: stale white bread rolls, milk, water, eggs, salt and chives for decoration (optional). Please note that this recipe is based on an authentic Austrian enriched yeast bread called Innviertler Zelten (or Zedl in dialect) which is the secret basis for the best bread dumplings by a mile. You can also use standard white bread instead, but you might need to adjust the liquid you add accordingly. 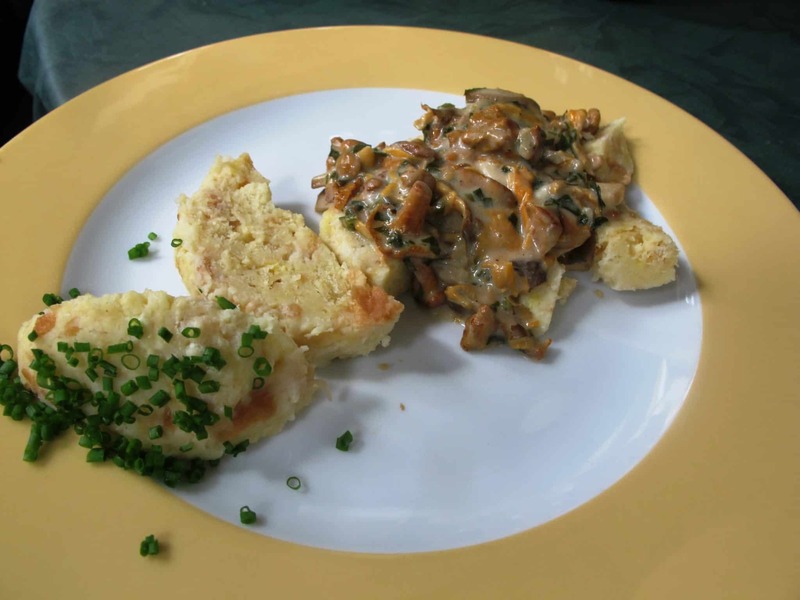 If you are using standard white bread, you may want to consider taking a look at this recipe for Serviettenknödel, by fellow blogger Ginger & Bread. Note: The bread should ideally be several days old and a little stale. Cover the bowl with a cover or use a plate or chopping board to cover it. This keeps the steam inside the bowl and helps to soften the bread cubes. Leave for about 10 minutes to allow the bread to soak up and absorb all the liquid. – There shouldn’t be any dry bits of bread in the mixture. If there are, add a little bit more hot milk or water. – On the other hand, the mixture shouldn’t be too liquid either or you are running the risk that the dumplings will fall apart. If you’ve added too much liquid, you should balance this out by adding a little flour. – Overall, the liquid should have been fully soaked up and the mixture should feel firm and just a little sticky. Once mixed, leave to rest for another 5 minutes before shaping the dumplings. Wet your hands, take a portion of the dumpling mixture to comfortably fit into your cupped hand and squeeze everything together while you shape and form a round dumpling. Bring a large pan of water to the boil – You can boil the dumplings straight away or leave them to rest for 30 mins. I would recommend this if you make the dumplings with normal white bread as they will keep their shape better. Add the dumplings once the water is bubbling away and boil for 15 minutes. Remove with a slotted spoon and place on a serving plate. Add chopped parsley or onions (fried) into the dumpling mixture to give it additional flavour. 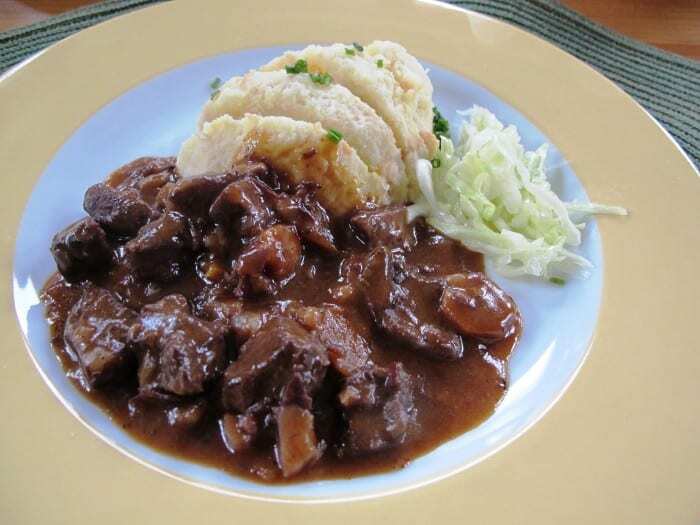 You could even add finely chopped smoked meat and eat as a main dish with cabbage salad. Chop the dumplings into bite-sized pieces, slice an small onion into very thing rings and mix with oil, white wine vinegar, salt and pepper. Voilà – dumpling salad! Slice up the dumplings and fry with 1 or 2 eggs, add a little salt and eat with plum compote. If you love dumplings as much as I do, there are a LOT more recipes in Maria Wiesmüller’s book ‘Knödel’ with cooking instructions for other favourites of mine: liver dumplings, Germknödel and Topfenknödel!